“I don’t think they’re all that sad. I have a few [songs] that aren’t sad, they’re like … hopeless.” Be Here to Love Me serves as the ideal double feature with Heartworn Highways, the 1976 documentary about the Outlaw Country movement. 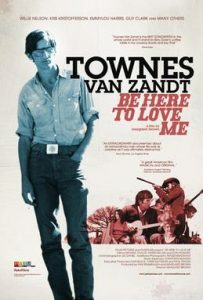 In fact, some of the best footage featuring legendary singer-songwriter Townes Van Zandt that appears in Be Here to Love Me first appeared in Heartworn Highways. Even if you’ve never heard of Van Zandt, you have probably come across some of his classic songs as recorded by other more famous artists like Emmylou Harris (“If I Needed You”), as well as Willie Nelson and Merle Haggard, who took “Pancho & Lefty” to No. 1 on the country charts in 1983. Directed by Margaret Brown, Be Here to Love Me delves into the fascinating and often self-destructive life of Van Zandt (1944-97), who left a legacy of amazing songs such as “To Live is To Fly,” “If I Needed You,” “For the Sake of the Song,” “Tecumseh Valley,” “Waitin’ Around to Die” and many others. The film features revealing interviews from the likes of Nelson, Harris, Guy Clark, Steve Earle, Kris Kristofferson and Lyle Lovett. Be Here to Love Me was listed No. 7 on Time Out magazine’s list of the “50 Greatest Music Films Ever” behind Monterey Pop (1968), Topsy-Turvy (1999), 24 Hour Party People (2002), Gimme Shelter (1970), Don’t Look Back (1967) and Superstar: The Karen Carpenter Story (1987).